By FFWPU Philippines, Rev. Julius Malicdem: Probably one of the biggest gathering held to celebrate Peace Road 2015 in order to commemorate True Father, the Rev. Dr. Sun Myung Moon’s 3rd Year Seonghwa Anniversary, was staged right at the heart of the Philippines in Manila. A huge turn-out of more than 4,000 people including around 1,400 bikers, have converged in the early morning of August 9, 2015 at the historic Quezon City Memorial Circle in Quezon City, Manila. “Spectacular!” “I love this peace event!”, exclaimed by one of the peace bikers after completing the 21-kilometer bike loop around the major roads in Quezon City which took the bikers around 1 hour and 40 minutes to complete. Coincidentally, the Peace Road event happened exactly 21 days before True Father’s Seonghwa Anniversary. As early as 5 in the morning, bikers from several biking associations assembled at the Liwasang Aurora in Quezon City Circle including bikers from the main stakeholders of peace in the nation, the military and police. Around 140 bikers came from the Armed Forces of the Philippines representing the three major services, Army, Navy, Air Force and including the General Headquarters. Also the Philippine National Police, the Bureau of Fire and the Bureau of Jail Management were also in full force with hundreds coming from their ranks from various places around Metro Manila and neighbouring provinces. Also, many members, peacemakers and supporters came to support this historic event. The Peace Road 2015 event in the Philippines is spearheaded by the Universal Peace Federation and Family Federation for World Peace and Unification together with W-CARP, Youth Federation for World Peace, Women’s Federation for Worlds Peace, Asian Clergy Leadership Conference, Asian Peace and Unity Corps with the support of other affiliates like International Peace Leadership College, Sun Hwa International Academy, Professors World Peace Academy and Asian Mobile Medical Service. The Quezon City Government, the Armed Forces of the Philippines, the National Bicycle Organization are the major partners with the great support from the Philippine National Police, Philippine National Red Cross and Metro Manila Development Authority. The staging of the Peace Road event would not have been successful without the support from all these government organizations and NGO’s and volunteer motorized bike groups who served as marshals. Everyone fully united with the vision of the event and great teamwork was indeed visible as the event is unfolding. The opening program started at 6:30AM with the singing of the Philippine National Anthem and the Universal Prayer for Peace offered by representative religious leaders. Then Hon. Atty. Bayani Hipol, Councilor of Quezon City and the President of UPF in Quezon City gave the Welcome Message. Rev. Julius Malicdem, the Chairman of UPF Philippines and National Leader of Unification Movement gave the Opening Address. He explained the significance and purpose of the Peace Road event and testified about the great vision and legacy of peace of the True Parents. He encouraged all the participants, partners, bikers, supporters and peace makers to truly become catalyst of bringing true and lasting peace. Many participants also became very much interested in the display booth featuring True Parent’s Autobiography book, “As A Peace Loving Global Citizen”. 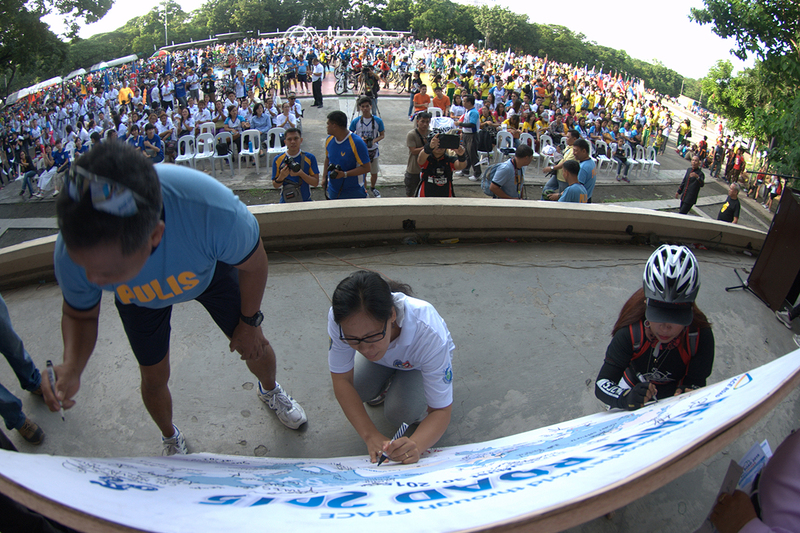 Then the signing of the Peace Road banner by representative leaders and participants followed. After the ringing of the “World Peace Bell”, the peace bike tour commenced. All were in high spirits and fully animated as the excitement of seeing a variety of bikers started to make their way out of the venue and onto the 21-kilometer bike loop around Quezon City. Few minutes after most of the participants had left after the event, the rain started to pour down as if blessing the successful event.